Do you love stamps and molds? I sure do! I’m willing to share my source for the tools in my studio that are my FAVORITES!!!! I don’t make them myself, so don’t write to me to order them, go straight to the makers–READY STAMPS. Create your own rubber stamp designs and texture plates for use with polymer clay, fabric or paper! Ready-Stamps is a community-based business of the United Cerebral Palsy Association of San Diego, promoting the independence of disabled persons through training and employment. They appreciate your continued support. 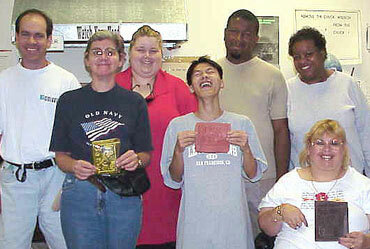 The Cerebral Palsy Foundation has a sheltered workshop division called Ready-Stamps that makes rubber stamps–the stamps you can order from most printers are made by this group. 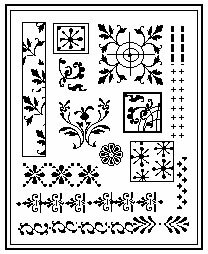 You can get uncut sheets of rubber stamps, made to your original designs, or with copyright-free designs. IF YOU SPECIFICALLY ASK you can also get the plate and matrix board with which it was made. I find that the matrix trays are my favorite tools of all that I’ve used with polymer clay, and I use them more than the rubber stamps–although those are great too! Using rubber stamps with polymer clay is a wonderful way to add interesting design elements, either by making an impression, or by using the stamps to apply inks, powders, or paints. My books “Create A Polymer Clay Impression” and “Celebrations With Polymer Clay” focus on the wide range of uses for polymer clay and rubber stamps, and feature stamps made at Ready-Stamps. You can see their use in textures all over this web site, including art in the banner at the top of each page. Print: You start with the artwork. You can use original drawings in pen and ink, computer graphic printouts, (the example on this page is a dingbat type font called “Fleurons” manipulated with a simple graphics program) or photocopies–this allows you to play with scale as well. Reducing designs can make quite a difference. If you are able to use a computer, you have access to a overwhelming amount of choices in fonts, images that are copyright free, and their potential variations in use! You can do your company name, your logo, a signature; or you can use designs from clip art sources and from hundreds of amazing books such as the Dover Pictorial Archive Series. Dover allows artists to use up to ten designs from this series in a single project without having to seek further permission. DO NOT try to use copyright protected material that is not of your own design. This includes cartoon characters and the likenesses of famous people or characters. If you WONDER if you have permission to use images, then its likely you don’t–unless the images are drawn by you, are from copyright free sources, or you have permission from the designer in writing. Just because a person CAN steal doesn’t make it right to do so. Respect Copy Rights. Transparency: When Ready Stamps receives your order, they first create a black and white transparency, similar to those used with overhead projectors. It is a negative print of the artwork that is sent for use. Everything that WAS black is now transparent.You can also use the black and white transparencies to create silk screen stencils with PHOTO-EZ screen print sheets. This plastic sheet is used to form the acrylic plate. Plate: This is a yellow acrylic replica of your 9 inch by 7 inch black and white artwork, with a raised surface like the rubber stamp, but hard. It is used to create the next matrix, but can also be used to press into polymer clay for indented patterns. It can be brittle, and cracks easily, but still can be useful! It tends to become curled up and even more brittle if exposed to sunlight, so I keep mine in a drawer. Matrix: This is a brown polymer board, with indented designs. The rubber is poured into this tray and then vulcanized. The matrix is absolutely wonderful as a plate of molds for polymer clay work. Its is one of my favorite and most used tools. You can press clay into the design, (powdering the matrix with talcum powder applied with a brush or a ponce bag a bit first helps) and remove the design element–trim rough edges with a blade, and apply to other clay as “trim” or “molding”. You can mimic filigree this way. Or you can use them as backgrounds and appliqué elements. Beads can be rolled along the matrix to impress the design, and staining after baking makes for some beautiful faux finish effects. Look at it this way–the matrix is the “in-ny” version of your designs,and the plate and the rubber are the “out-ies”. Rubber: The final product at Ready-Stamps is the rubber. 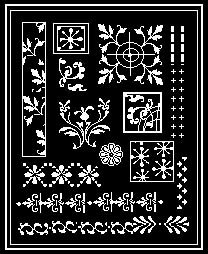 This is sent to you in the uncut sheet, and you can cut and mount it if you choose to do so.The rubber sheets can be cut with scissors around the design elements if desired, and then mounted with rubber cement or double sided tape to blocks of wood, foam board, or baked clay handles. You can also cut it into sheets that can be rolled along with the clay through a pasta machine! DO NOT bake or heat the rubber. Store your rubber out of the sunlight and away from heat sources. You can also order more than one sheet of rubber made from your designs if you wish, although there is a small additional charge. Mica powders such as Pearl-Ex pigments can be used to highlight raised areas while the clay is still raw. Mica shift effects using either the matrix or the stamps with mica bearing clays create an almost holographic look. Acrylic or heat set oil paints can be use to fill in baked areas for a faux enamel effect, or fill with soft clay and re-bake for an inlaid effect. 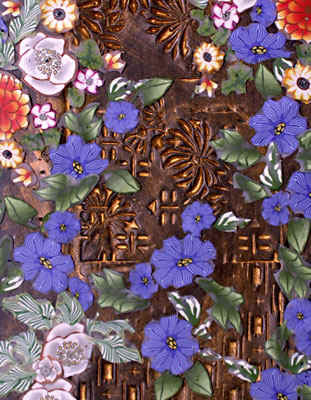 Donna Kato’s “brocade” technique uses acrylic paints filling the indented patterns in a sheet of clay, which is then rolled flat after drying. The indentations can be left raised for a faux enamel look. Shown here, it is mixed with slices of flower canes. The results look very rich and detailed, as do silk screened patterns using the same designs on Photo-EZ sheets. Rubber stamps and silk screens together can be used on fabric, paper, polymer clay, acrylic beads and more. The stamps can be used as texture sheets when using Shiva Paint Sticks on textiles and polymer clay both to create wearable art fabric and matching buttons and jewelry! Use cut out drawn or photocopied images, and arrange them inside the rectangle with room between the design elements so that they can be cut apart in the rubber form but don’t leave a lot of white showing–add more designs! Fit in as many as you can and you will see what an amazingly economical set of tools you will be getting. Scans and printouts can be used to finalize the set of designs desired and eliminate any “paper cut lines” that may be showing from the pasted images. Try cutting squares or strips of images with interesting “texture” patterns. Avoid hair thin lines and very large dark areas. Paste into place (I use a glue stick). Arrange the pieces so that juxtapositions of images next to each other can also be used–they can form interesting patchwork style pieces. When mailing, sandwich artwork between 2 sheets of cardboard so it doesn’t wrinkle or smudge–every mark is reproduced when the stamps are made! 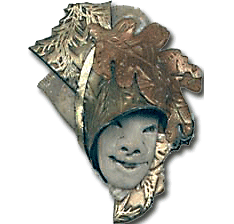 Send artwork along with $32.00 (plus $5.00 shipping/handling) for EACH 9″x7″ sheet of artwork . Remember to specify PLATE, MATRIX, and RUBBER and TRANSPARENCY when you order–some people don’t use all four but they are wonderful tools for making texture and pattern in pressed paper or polymer clay. Remember that the black images shown on your original artwork will be the same thing that is printed by the stamps–so there’s no need to reverse words when ordering. HOWEVER–if you want to use the matrix plates for words, they must be reversed.